First, I have secured a space and date for the display of the painting “The House That Jack Built”. I will, again, do a Solo Art Exhibit at Ukazoo Bookstore. Scheduled for the months of September/October. The tentative opening reception is Sept 12th. It is a ways off, but the time works for completing other art images (both paintings and watercolor/pen & ink) and all the necessary framing in order to display a full Art Exhibit to complement the main subject, “The House That Jack Built”. I have another Solo Exhibit in May, at the Laughing Pint Tavern (Highlandtown) but that is for Watercolor/Pen & Ink works only). Back to the painting. “Jack”, the center motif, while a part of “The House That Jack Built”, is a separate painting of its own. Divided into four segments, each section will display a different aerial view. 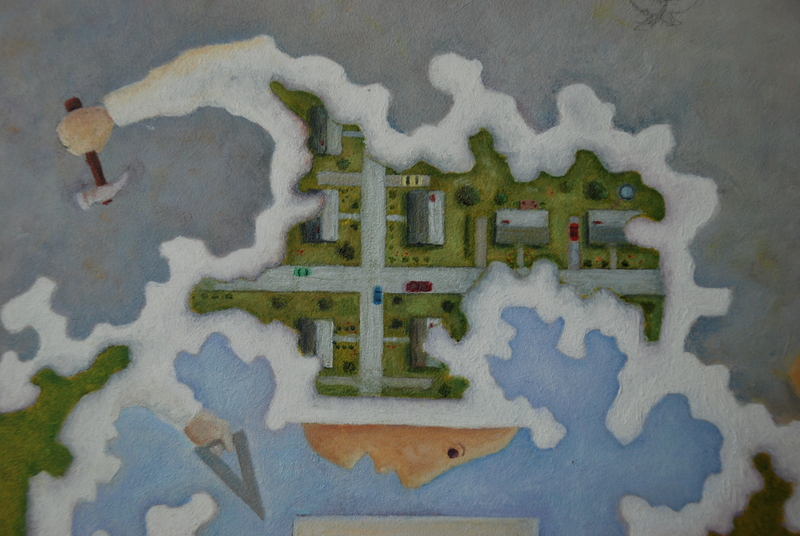 Working with the smallest of brushes and some assistance from a magnifying glass, it is best seen on-line as one section at a time and this week’s section (the top segment) reflects suburbia. For size reference, the horizontal road measures 3 3/4” in length, the vertical road 1 7/8”. For a refresher or those new to the painting, see Week 16 & 17 for a view of the “Jack” Four segment motif. As with the rest of the painting, once this portion of paint dries, I will be reworking colors, detail, adding shadows, any additional embellishments, etc. Huzzah! Congratulations on your upcoming shows. Great to have a showing, congrats…! An artist to be reckoned with… so cool! Loretta, Thanks for the reblog and the comment.